Attorney – Anthony J. Scarcella, ESQ. Scarcella Law Offices, is dedicated to helping people recover financially from the harsh impact of a personal injury or wrongful death. We have helped many hundreds of clients secure millions of dollars in damages. 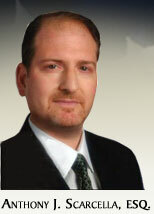 Anthony J. Scarcella is a New York native who has practiced in the area of personal injury law since 1990. Anthony J. Scarcella marshals all the resources at his disposal to maximize compensation for victims of auto accidents, work injuries, or any other injuries caused by the negligence of others. We represent victims and their families throughout the New York City metro area and Westchester County. Contact Scarcella Law Offices for a free consultation.